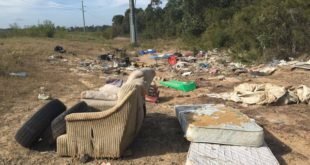 Member for Lake Macquarie Greg Piper today announced that Lake Macquarie City Council has been awarded a $71,615 grant to continue targeting illegal dumping. The money will allow the council to expand its successful illegal dumping prevention program as well as target new hotspots. Under this round of funding, hotspots at Wyee, Awaba, Glendale and Brightwaters will be targeted. The grant was made available under the NSW Environment Protection Authority’s ‘Waste Less, Recycle More’ initiative. It was among 15 projects statewide which were awarded funding in the latest round, collectively worth $900,000. “It’s great that the council has been able to secure this funding,” Mr Piper said. “It’s the fifth year in a row that the council’s application has been successful, so I thank the Government and the EPA for helping the council to continue its war on illegal dumpers. Lake Macquarie City Council’s Acting Manager Sustainability Dean Chapman said the grant would help the council and the community tackle illegal dumping in the city by carrying out preventative measures at the four hotspot sites and supporting the Eco Angels clean-up program. For more details about the illegal dumping grants visit www.epa.nsw.gov.au/wastegrants.